Damages in a Wrongful Death Action - Giometti & Mereness, P.C. The amount of damages recoverable in a wrongful death action is governed by statute. It depends on who files the action and the circumstances surrounding the death. To learn more, contact us to set up an appointment with one of our experienced personal injury attorneys. At Giometti & Mereness P.C. we are experienced trial attorneys. Economic damages are recoverable for spouses, heirs, and parents who file a wrongful death action. These damages commonly include the direct loss of economic support. In certain circumstances the wrongful death statute places no limit on the economic damages recoverable. Formerly, plaintiffs were unable to recover non-economic damages in wrongful death actions in Colorado. Colorado law now permits juries to award non-economic damages in wrongful death actions. These damages include compensation for grief, for loss of companionship, for pain and suffering, and for emotional distress. If a victim survived for a period of time following an accident or injury, the personal representative of the decedent’s estate may file an action under the “survival statute”. The personal representative of the deceased may file this type of action even if the deceased’s spouse and/or heirs have also filed a wrongful death action. Damages available in a survival statute action include expenses related to lost income and medical expenses incurred before the decedent’s death. 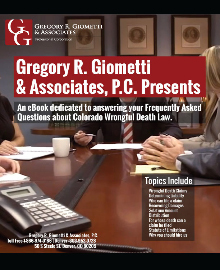 At Giometti & Mereness P.C., we have extensive experience handling wrongful death actions in Colorado. To learn more contact us to schedule an appointment. Visit our information center on wrongful death.